Poipu Shores 103A is an amazing air conditioned condo on the oceanfront in Poipu. 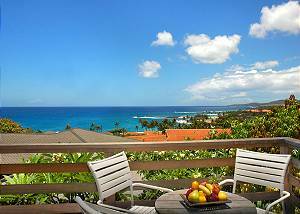 Perched above the southshore's scenic coastline, stunning whitewater views, less than a 200 yard walk along the tidepools to Brennecke's Beach & Poipu Beach & Park. 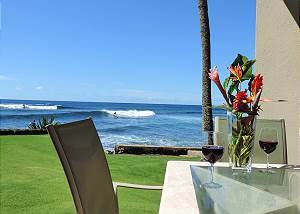 The living and dining room at Poipu Shores 106A are oceanfront, right on the water and professionally decorated. A large TV, full stereo, quality speakers, DVD and sliding doors that open to the splendid oceanfront lanai and A/C in the master bedroom. 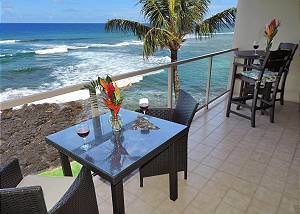 Poipu Shores is one of the most amazing oceanfront condos on Kauai! 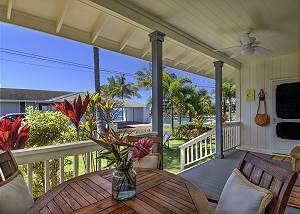 Perched above the southshore's amazing, scenic coastline, less than a 200 yard walk along the tidepools to Brennecke's Beach and adjacent award winning Poipu Beach and Beach Park. 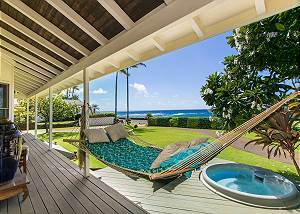 Ho'ona Hale is situated in a quiet Poipu residential neighborhood, fronted by Baby Beach & adjacent to sand, surf, & snorkeling. 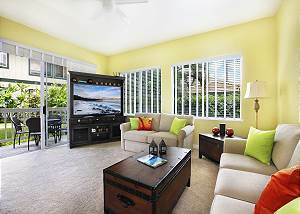 Featuring unobstructed whitewater ocean views, swaying palms, sunsets, and recent, tasteful upgrades that include A/C. Capture a 180 degree dramatic view of the surf, the beach, the whitewater. Spectacular Poipu sunsets from the spacious lanai, living area and both bedrooms of this ground floor, Air Conditioned unit footsteps from the beach. 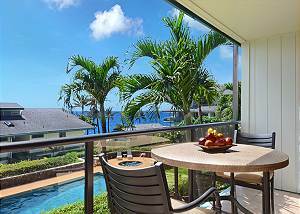 Hale Malanai - 2 Bedroom Baby Beach Poipu Vacation Home. A seashell's throw from scenic, crescent shaped, sandy Baby Beach in Poipu. 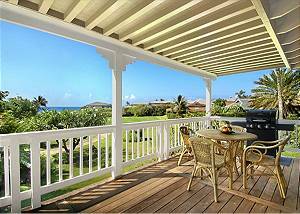 This lovely beach house is surrounded by a spacious covered deck. Ocean view 3 bedroom, 2.5 bath with A/C, Shipwreck’s Beach Cottage, with resort pool, tennis courts, and short steps to white sand, crescent shaped Shipwrecks Beach offers commanding, unobstructed whitewater views, and is short walk to the Grand Hyatt. Entering Amazing Views Hale is a monumental treat for the senses! Exhilarating scenes of crescent shaped white sand beaches, swaying palms & sunrise to sunset views surround this eclectic two story beach house, complete with lap pool, hot tub, and BBQ! 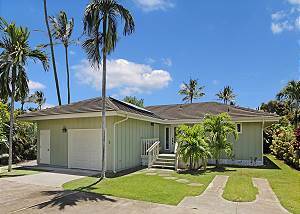 Completely remodeled, spacious, comfortable Poipu 3 bedroom, 3 bath home, NOW HAS A/C! 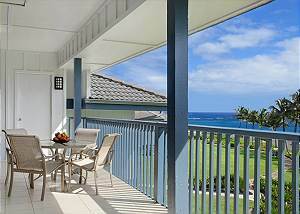 Walk to Brennecke's Beach & Poipu Beach, both can be seen from the home. 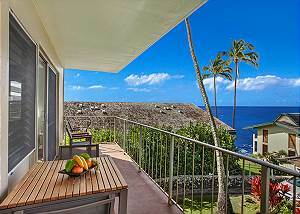 Charming decor whitewater views, sparkling sand & jaw dropping beautiful Pacific ocean sunsets. On the sunny south shore of Poipu, complete with oceanside hammock and hot tub, huge front yard, incomparable sunsets, and an abundance of beach activities, is charming Koa Cottage, the perfect vacation choice. 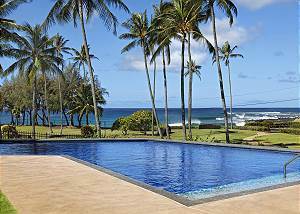 Alohilani is an immaculate, private, spacious estate, beautifully appointed & furnished, a huge swimming pool, gourmet kitchen, covered lanais, and ocean & mountain views. 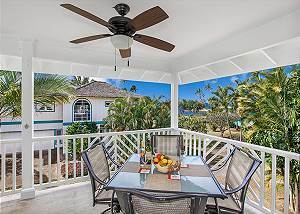 Sleeps 10 people in 5 ductless air-conditioned bedrooms. 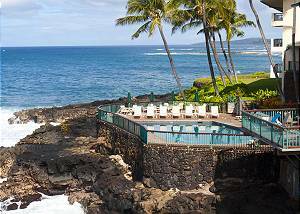 Honu La'e located on the "wall" near Koloa Landing in the heart of Kauai's scenic South Shore, close to numerous ocean activities including world class body surfing, snorkeling and swimming. This well tended detailed home has A/C among other luxurious. Nearly oceanfront on the lovely southshore, in the heart of Kauai's premier resort destination & a 10 minute stroll to Poipu Beach is lovely Sunset Kahili #101. The new owner has beautifully remodeled her unit with an eye for quality & guest comfort. Poipu Sands 312 is the perfect condo to hang your hat after a long day at the beaches, Shipwrecks, Mahaulepu & Poipu Beach. 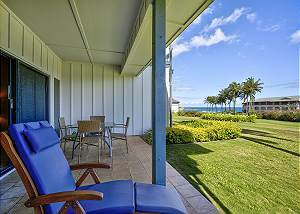 Enjoy the beautiful sounds of the waves crashing along the shore of Shipwrecks Beach while you relax on the lanai with your family. 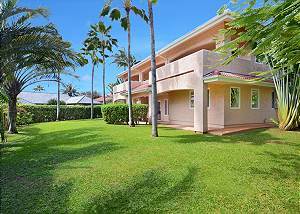 Kahala Poipu Kai 312 - Outstanding Poipu Beach Views & Proximity. A portable A/C is located in the living area for your comfort. Beautiful views from this ground floor end unit that opens to rolling green lawns and the greenbelt walkway to the beach. One story, detached cottage, 2 Master Suites with A/C's. The back yard has a BBQ grille, dining table, and banana trees. 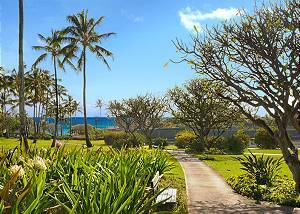 Just outside the door is the landscaped walking path to the pool, hot tub, tennis courts, Poipu Beach & Shipwrecks Beach at the Hyatt. 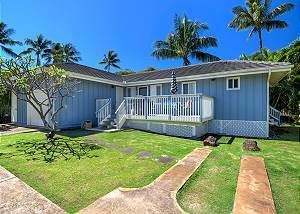 Hale Loke is a beautifully furnished and appointed single story detached cottage (no neighbors above or below) located in the heart of the Poipu Kai Resort, recently renovated, Hale Loke Cottage features two master suites with A/C and a beautiful location. After an activity filled sunny day on Kauai, you can enjoy the sounds of the surf breaking on Shipwreck Beach as you relax on the private lanai of this amazing two-bedroom ocean view condo. Manualoha Condo Unit #101 is a ground floor, privately located end unit on the knoll just above world famous Poipu Beach Park and Brennecke's Beach. The premiere location makes it a short walk to Poipu Beach. There is one bedroom and a loft 2nd bedroom. Gorgeous, spacious ground floor, end unit with two portable A/C's. Pride of ownership is evident in every generous accouterment the owners provide, including granite counters, beautifully tiled kitchen and baths, comfy beds & beautiful linens & cookware. Poipu Kai Resort's Regency 311 reflects gracious living at its finest. Located in a lush garden setting, this updated corner unit is a short 5 minute walk along the beach trail to Brennecke's & award winning Poipu Beach; 25 steps to the Regency pool. Shaka Hale is located in Poipu Kai Resort's Bayview subdivision, footsteps to Shipwrecks Beach, the Grand Hyatt Resort, and Poipu Kai's pool and tennis club. Ground floor, one level, 3 bedrooms, 2 baths, meticulous, comfortable with outdoor garden and BBQ. This beautiful ground floor, ocean front unit is a hidden gem in Poipu. 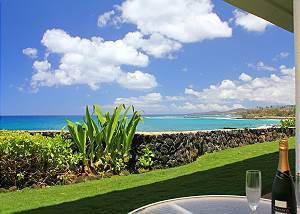 From the breathtaking lanai enjoy views of whales, spinner dolphins, turtles playing in waves, white water crashing on the cliffs, spectacular sunsets. You will never want to leave! 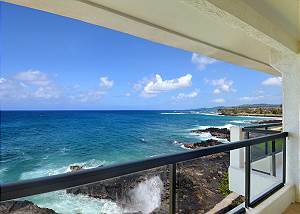 Sea Cove Hideaway is honeymooners luxury townhouse-style condo at Poipu Shores, perched along a cliffside overlooking the dramatic deep blue Pacific ocean. 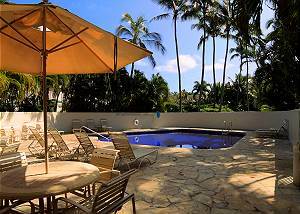 Poipu Shores 105C, is recently Air Conditioned making it a relaxing, private retreat. Surf, snorkel, swim, sunbathe on the beach within 35' from the lanai of this Air Conditioned, 2bedroom/2bath "Penthouse" oceanfront, corner unit, located on the 4th, top floor of Kuhio Shores Resort. Unobstructed ocean views from living areas & bedrooms.